Die Klasse 7c des bilingualen Zuges der Wilhelm-Lorenz-Realschule besuchte in Bad Rippoldsau-Schapbach das Tierschutzprojekt, das Bären und Wölfen aus nicht artgerechter Haltung ein neues Zuhause in natürlicher Umgebung gibt. Kim und Ruben, die beide die Klasse besuchen, schrieben dazu folgenden Bericht. 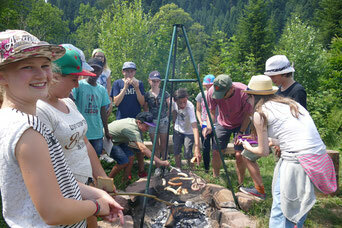 On June 22nd we – class 7 c – went on a trip to the wolf and bear park in the Black Forest. The park gives a new home to animals that were kept badly. We went there by bus and had a lot of fun on the bus. The wolves and bears live in an enclosure in the forest. When we arrived Sabrina, our guide, showed us the wolf and bear park and told us a lot about bears and wolves. The most interesting thing was the story of the lives of the bears – most of them were kept badly in small cages in zoos or in a circus before they came to the park. The bear cubs Arthos, Arian and Agonis have no mother because people had killed her to get the baby bears. If you look at the teeth of bears you can see that they are omnivores. Wolves are carnivores, they eat a lot of meat. We took a lot of photos there. At the end of the tour we got a task from Sabrina: We had to choose a bear and watch him to answer questions. When we had finished we went to a fire place and had a barbecue there. After that we went to the bus and drove home. We all were very tired. We really liked the day trip.